Each Push message is a Container of actions that defines actions or transactions to be executed when the message is received. 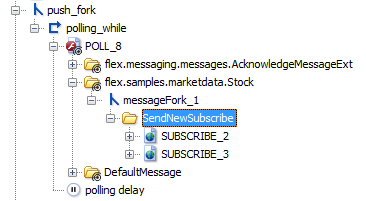 In the following case for example, the User Path carries out a new subscription upon receiving a message of the type flex.samples.marketdata.Stock. Information: Since the Push message is executed in the same execution thread as the Push request, it is recommended to place all the actions for a message in a fork action to avoid interfering with the polling or streaming request execution. For more information, see Fork.